It’s time to put myths, legends, and mysteries to rest. Sales rank has been elusive for too long, so thanks to the support of NovelRank donations, I’ve conducted a series of tests to answer some long standing questions about this elusive beast we call, Amazon’s Sales Rank! MYTH: Sales rank improves when a review is added. Reality: False. Testing reviews, verified purchases as well as unverified reviews had no effect on a book’s sales rank. This is false for anything except actual sales which do effect sales rank. MYTH: Sales Rank automatically returns to original value when a kindle book is returned. Reality: False. This was tested by purchasing a Kindle book at 5:47am. 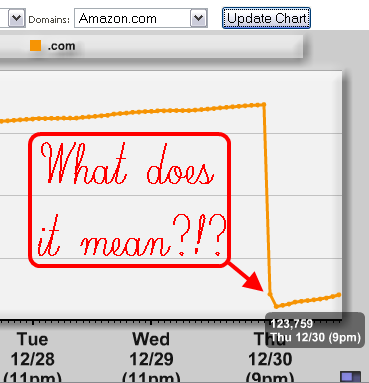 at 8am, Amazon reflected the new sales rank. At 8:30am, customer support was contacted and the e-book was returned. Sales rank deteriorated normally and did not reset back to the original pre-sale value. MYTH: Book purchases effect sales rank immediately. Reality: False. There is a 3 hour delay between when a purchase is completed and when the sales rank is reflected by Amazon. This ensures that the order will not be canceled (they are fast). This is true for both Kindle and print purchases. MYTH: Purchases that are affiliate driven (Amazon pays a percentage of the price to the affiliate referrer) do not effect sales rank. Reality: False. 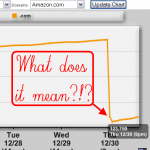 There is no difference to Amazon between an affiliate sales and a sale driven by Amazon.com direct searches. To them, a sale is a sale is a sale is a… you get the idea. 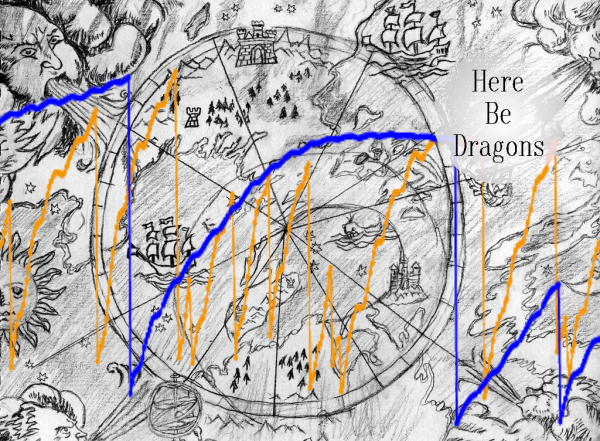 The above image began with “fairy tale map” by angelic0devil6, Creative Commons: Attribution license. MYTH: Purchasing multiple copies on a single order does not improve sales rank like purchases made on two separate orders. Reality: True! To perform this test, I purchased three different books within a single order. One was a control (single copy), one had two copies purchased in a single order, and the last had a single copy purchased. After submitting that order, using the same Amazon account, 10 minutes later I purchased a second copy of the 3rd book (which had a single copy purchased in the first order). The results? After 3 hours, all 3 books moved from a rank of 1,020,000 (+/- 14,000) to a rank of 123,500 (+/- 500). After 1 additional hour, the 3rd book moved to a rank of 64,000, reflecting the second purchase order! MYTH: A canceled order will cancel the sales rank effect. Reality: True. Purchasing a copy of a print book and then canceling the order 20 minutes later (while still allowed by Amazon) will not trigger a change in sales rank. I hope everyone enjoyed this insight. If you have any myths you’ve always wanted busted, put them in the comments below. This is one of those tests I wanted to do for a long time, so I’m glad to finally get this information into the hands of authors. Basically, increase sales, and if possible, have them all happen at the same time using separate orders on Amazon to ensure the largest effect on sales rank! Make sure to use the links below to share this post with your fans and fellow authors. Finally, thanks for using NovelRank and thank you to the supporters whose donations made this possible! This entry was posted in Research and tagged sales rank, salesrank on January 4, 2011 by Mario Lurig. You’re the best, I’m a huge fan so kep up the great work. I know how much time you are saving people and it is very much appreciated from me. Thanks for your super-quick response. Just in time to make some decisions. You’re a kind, good person. Thanks for being out there for people like us! Recent self-published book, Winning Presence for Business Presenters. Wondering: Is rank “shared” across Kindle and print? In other words, if you sell half your books on Kindle and half on print, do the two get added together to describe your rank? Or could one accidentally cut their own ranking in half by having both print and kindle sales going at once? Thank you so much for this! Your website has been such a benefit to me. I’m assuming the info on re-purchasing books in separate orders in still accurate, even if the credit card is the same? Question: I have a new book I’m tracking on novel rank and love the site. I purchased 10 copies as “gifts” as 10 separate orders, but don’t see the numbers reflected in the sales?? Wow, this is very useful and concise information. I just released my first book and am learning a great deal. Thank you! This is an informative post. However, I do not believe that it always takes three hours to impact sales rank. In February when I first launched my book, as soon as I knew it was live, I bought a copy. I tweeted it at the same time and two more copies sold instantly. The next hour, I had a rank of something like 11,000. This is for a kindle book. So it only took an hour for initial sales to take effect. Also, last month, I was featured on a site and this triggered a lot of sales, and my rank dropped a lot within 90 minutes of the post going up and the sales starting. This one I suppose you could argue that it may have actually gone live in some form earlier -in conjunction with my initial observation, though, this suggests that the 3 hour rule is not hard and fast. My trick has always been substitute “causes” for effect and “influences” for affect. In the case of this post, these myths are finding what causes sales rank to change, so the usage is correct. If you feel otherwise and can explain it, I am more than happy to fix a grammatical error! I’d feel so much better about trusting these myth-busters if you were using the word “affect” properly. You mean to say: “What affects changes in sales rank?” Thanks. pre-sales count as they effect sales rank, thus count just like any other sale. Regarding the best-seller list, no idea, as that is something independent for amazon. regarding collecting purchaser information, there is no way to input sales into Amazon. They automatically track sales made THROUGH amazon only. What about pre-sales? (1)Can you pre-sale your book on Amazon before the launch date? (2) Do the pre-sales count towards the best seller list on the launch date? (3)If you went to a tradeshow and collected purchasers information there, could you input it into Amazon? Yes, with the exception of the Kindle specific return test, these were done with print books. Judging by the results and some other less formal testing, Kindle book purchases should reflect multiple sales as each one is a separate purchase (You can’t buy 3 copies of a Kindle book at once). Just wondering if you test for ranks effects by buying books was done with print books? Does this also apply for buying kindles, or is one purchase all that will ever show no matter when you buy (or even gift) another. Okay, it’s not “my” myth, and I don’t actually subscribe to it. But it does seem to be a prevalent theory floating around these days. This information is SO helpful! Thank you so much for all you do to help us along in this process. Thanks for sharing experiments with us. Any insight we can get into the magical, mythical world of the Amazon sales process is a great help.